Thunder Matt's Saloon: "In Soviet Russia, Baseball Catches You!" Tomorrow evening I will temporarily say goodbye to this fair country of ours, on a mission to find baseball in the former Soviet Union. As I breach the Iron Curtain, I will take comfort in knowing that life in America will go on without me for the first time (unless you count trips to Mexico). Baseball will still be played, my mailman will still visit the house, and bread will remain attainable. Where I am heading, however, is dark and full of intrigue. Actually, it's just St. Petersburg, which I'm told is quite European. Nevertheless, my search for the first great Russian baseball player (Kouzmanoff has proven nothing) will hopefully be prosperous. If I am not heard from again, it will be likely due to my poor American tolerance for vodka, coupled with slurs against Putin within earshot of the KGB. I hope to see you all again someday. 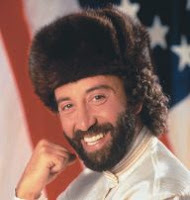 If I don't, make sure Yakov Smirnoff speaks well of me in Branson.